With the busy lifestyles we lead today, it can be a challenge to find convenient ways to exercise. 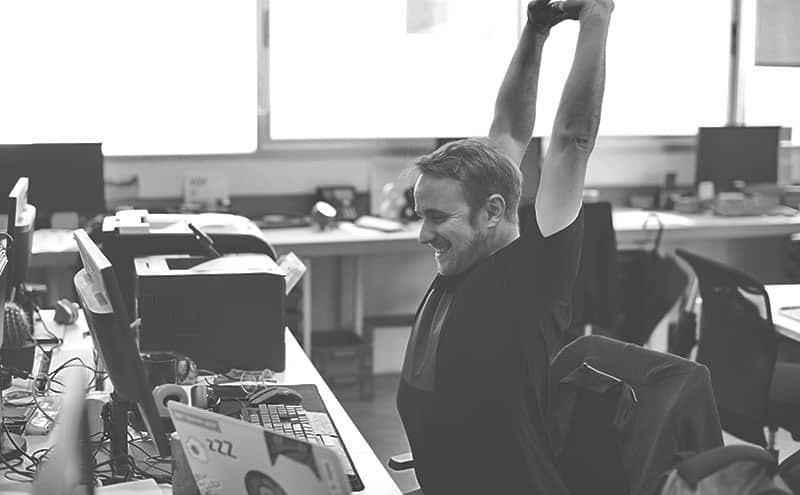 The best pedal exercisers allow us to achieve a cardiovascular workout that also strengthens muscles and improves circulation, and can be undertaken at the office or at home. Very wide range of resistance levels. Quiet and smooth pedal function. Fits under low desk heights. Suitable for users who want low-resistance exercise. Compact lightweight and sturdy product. Easy to assemble and fold up. Stable and bidirectional pedal exerciser. Comes with free anchor strap. A pedal exerciser is a portable piece of equipment with two bike pedals joined onto a central stationary platform. Most products feature an adjustable resistance dial, which means you’re able to build strength and fitness by varying your levels of exertion. A pedal exerciser is good for strengthening the arms and legs through low impact cardiovascular exercise. This type of workout also tones the body, burns excess calories, improves joint mobility and aids circulation. A pedal exerciser can be beneficial for people of all ages. They can be used for physical therapy and rehabilitation after an injury or operation, to strengthen weak or sedentary muscles, and to improve cardiovascular fitness and blood circulation throughout the body. They’re also be beneficial if you’re returning to exercise after a lengthy break, as it’s both a low impact and low risk form of exercise which is safer for your musculoskeletal system. How Do I Choose the Best Pedal Exerciser? Before you choose a pedal exerciser, it’s important that you first discuss your needs with a fitness or medical professional as they can best advise you on the product that’s most suitable for you. It’s particularly important to do this after surgery or if you’re rehabilitating an injury. Pedal exercisers have various features that you need to take into consideration when choosing one. A lot of products feature a range of resistance levels, which allows you to change up the difficulty of your workout and adjust this as required. Some pedal exercisers have a small display screen, which gives you readings such as distance travelled, time taken, revolutions per minute and calories burned. This is really helpful for those who want to monitor their workouts and measure their progress. Many products have straps attached to the pedals, which keep your hands or feet in place while you exercise. Non-slip rubber feet on the base of the equipment help to stop it from moving, and some models feature a strap which can attach the product to your chair for added security. It’s possible to fold up some models of pedal exercisers, which makes storing or transporting them much more simple, and a built-in handle also makes moving the product easier. A pedal exerciser is simple to use. You need to sit down in a chair or on a sofa, position the equipment in front of you and place your feet in the pedals. If it’s possible to adjust the resistance, choose the level which is best for you. Then begin pedalling your legs in a forward motion. To exercise the arms, it’s most effective to place the pedal exerciser on a table or desk with your hands on the pedals. The length of time you need to pedal for and the intensity of your workout should be discussed with a medical or fitness professional, as they can advise you on the best way to use a pedal exerciser for your age, level of fitness and any injuries or conditions that affect you. What Are the Features and Benefits of a Pedal Exerciser? Pedal exercisers have numerous features. Being able to change the resistance level of your workout means you can improve your cardiovascular fitness, increase strength, vary the intensity level, and work your way up to more difficult tasks. Many models of pedal exerciser have LCD displays, which show you various readings including time elapsed, distance covered, calories burned and revolutions per minute. This product can also feature straps to secure your feet on the pedals, rubber gripped surfaces on the underside of the base to prevent slipping, and a strap to secure the pedal exerciser to the chair you’re seated in. Low-impact cardiovascular exercise, which can be done using a pedal exerciser, has many health benefits. It places less stress on the body, which is particularly beneficial for the hip, knee, ankle and back joints, while still increasing your heart rate and strengthening your muscles. A pedal exerciser is a great way to get regular aerobic exercise conveniently. Regular aerobic exercise reduces the likelihood of many health problems, including heart attacks and strokes, and has also been found to positively change the area of the brain which is involved in learning and verbal memory. What Is the Best Pedal Exerciser? With a variety of different products available, finding the best pedal exerciser for you can be challenging. We’ve made things easier for you by choosing five of the most popular models currently on the market, and evaluating each of them on features, quality and value for money. 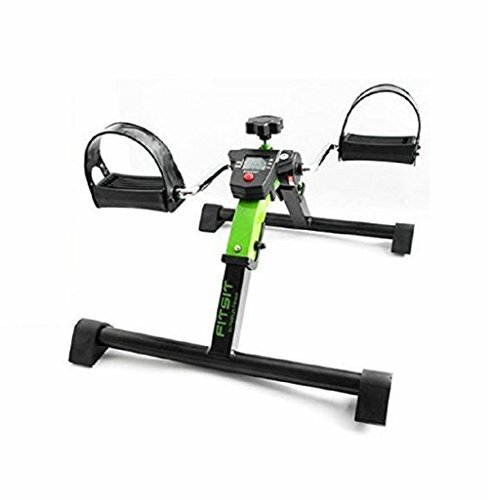 This commercial-grade pedal exerciser is compact and lightweight, with a solid steel base and frame. The wide 15-inch base ensures optimal stability, and the sturdy design will withstand a lifetime of usage. It’s recommended by medical professionals and physical therapists to provide therapy for a wide range of conditions. This pedal exerciser features a bidirectional pedal motion, which means the pedals move forwards and backwards and this helps to work different muscle groups. The pedals can be used for both arm and leg workouts, and the molded surface of the pedals combined with adjustable Velcro straps ensures a secure fit for both hands and feet. This pedal exerciser features a battery powered LCD monitor which displays time, speed, distance and calories burned, and accumulates these values until you reset the monitor. This product has a very wide range of resistance levels, over two times the range of similar models, and the five rotation dial allows you to choose precise resistance levels. A 39-pound flywheel weight ensures the pedals move with a smooth motion. Huge range of resistance levels. Good for balance issues and surgery rehabilitation. Metal parts can heat up. Pedal straps too narrow for some users. This pedal exerciser can function under desks as low as 27 inches, as the pedal height is only 10 inches. This low height and wide 23-pound base helps to stabilise the product and stop it from rocking and moving while in use. The pedals move bidirectionally, and adjustable Velcro straps help to keep your hands or feet comfortably on the large pedals. The lowest resistance setting of this pedal exerciser may feel like you aren’t doing much, but it increases your energy usage by 50 percent and improves the flow of oxygen to your brain. This kind of low-level cardiovascular exercise aids in burning calories and improving joint mobility, general health and mood. This pedal exerciser features a multi-function display, which gives readings for time, distance, speed and calories burned, and you also get access to an online calorie counter for the most accurate reading. Eight calibrated resistance settings offer over double the range of tension on other similar models. An effective flywheel and magnetic resistance cause the pedals to move smoothly and silently, unlike the noisy friction resistance common in other similar products. Access to an online calorie counter. Display setting resets after 1000 reached. 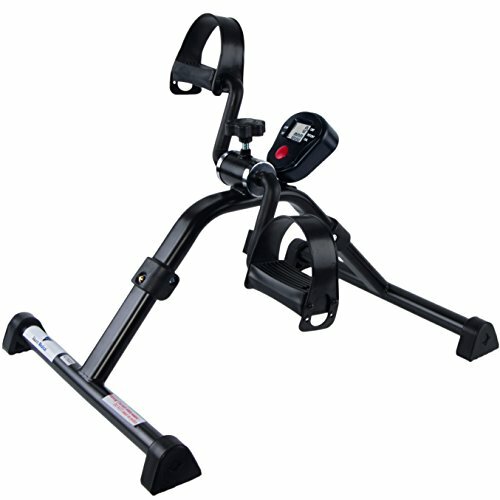 This pre-assembled pedal exerciser is lightweight and portable, yet sturdy and durable with a metal frame. It can be used in the home, at a work desk, or while travelling as its ability to fold up makes it convenient and easy to move and store. 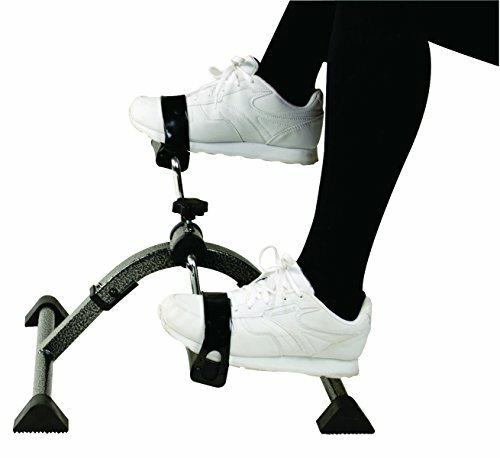 This product features pedals with integrated straps attached, which means it can be used to exercise the legs and the arms. Textured rubber pads on the base of this pedal exerciser prevent marks and slipping on all surfaces, ensuring safety and security during use. This pedal exerciser can be used as a low impact form of exercise, which is beneficial physical therapy for many conditions. Using this product helps to improve circulation, tone muscles and burn calories. It’s easy to adjust the resistance level by moving the tension screw, and this allows you to vary the intensity of your workout to suit your ability, and eventually achieve more difficult tasks. Easy to fold up for storing or moving. Low resistance level may not be sufficient for some users. May not fit under lower desks. This pedal exerciser is lightweight and comes fully assembled, and the quick release folding mechanism means you can easily transport or store it. Rubber feet on the base of the pedal exerciser ensure stability and traction on all surfaces, and help to stop it from moving during use. This pedal exerciser provides a low-impact form of gentle exercise, which can be used during physical therapy to boost circulation and strengthen muscles. It can also be an effective method of exercising the arms when placed on a table or desk. The digital LCD monitor displays time elapsed, number of revolutions, revolutions per minute and calories burned, and the tension can be altered to change the resistance using the adjustable knob. Beneficial for swelling in the feet. Not designed for rigorous fitness use. Narrow straps can’t be adjusted. This pedal exerciser is available in a variety of colours, and the folding, powder-coated frame is easy to assemble, clean, travel with and fold away for storage. It features non-marking footpads which prevent slipping while the product is in use, and the included anchor strap secures the pedal exerciser to your chair to prevent it from moving during use. This pedal exerciser also has an LCD display which can be set to a choice of five readings; revolutions per minute, total revolution count, exercise time, calories burned, or a scan through all four. Cool Rev technology prevents this product from overheating, which is often a problem with similar pedal exercisers. 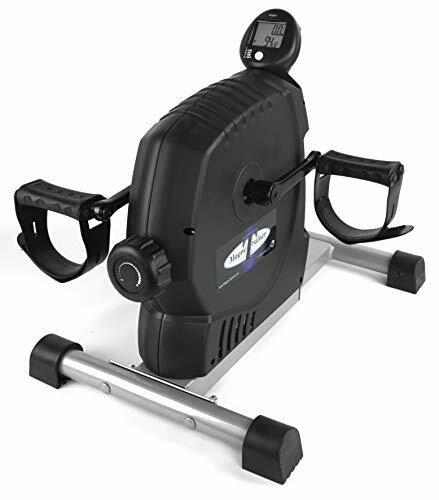 This product is beneficial for both fitness and rehabilitation, it features bidirectional pedal motion to work different muscle groups, and the integrated straps on the pedals mean it can be used to exercise both the arms and the legs. Free anchor strap to attach to chair. Not suitable for intensive workout. Parts can heat up during use. Counter automatically resets at end of session. Doesn’t fit under some desk heights. After evaluating our five products, our choice for the best pedal exerciser is the MagneTrainer ER Mini Exercise Bike Arm and Leg Exerciser. While it was one of the more expensive models that we looked at, it’s a high-quality product featuring magnetic resistance and a flywheel. This means it’s a lot quieter and the pedal function is smoother than the other models. The MagneTrainer pedal exerciser also features an adjustable resistance range that’s far superior to any of the other products we evaluated, including the DeskCycle exerciser. The MagneTrainer’s range of resistance levels makes it the most versatile pedal exerciser and suitable for a variety of uses, from physical therapy and injury rehabilitation to an intensive workout. 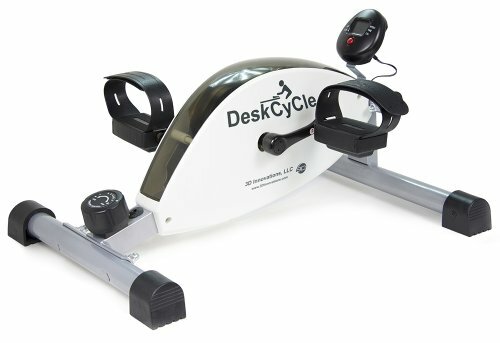 Although the size of the DeskCycle exerciser allows it to fit under a variety of desk sizes, it had some manufacturing issues which reduced its overall quality. The combination of versatility, durability and quality of the magnetic resistance mechanism makes the MagneTrainer ER Mini Exercise Bike Arm and Leg Exerciser the best pedal exerciser currently on the market.